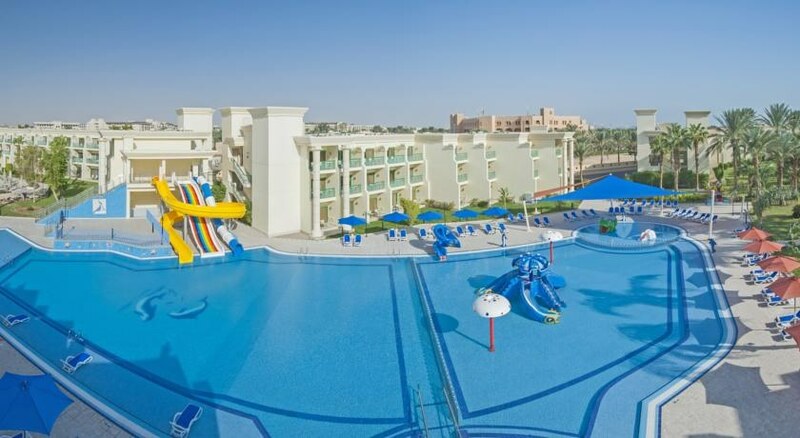 Hilton Hurghada Resort is a luxurious 5-star beachfront resort situated in the heart of Hurghada, Egypt, offering a plush stay amidst excellent guest amenities and warm hospitality. Featuring a private beach, three lovely pools and its in-house watersports centre, this beautiful property set against the magnificent Red Sea is a retreat to recharge your energies and relax. Modern, well-appointed rooms in contemporary décor overlooking lush gardens and offering gorgeous sea views invite guests to retire in comfort after a busy day. These are furnished with fridge, tea & coffee making facilities, minibar, iron & ironing-boards. Splash-tastic fun can be had at the watersports and diving centre where equipment and training is available for Red Sea scuba-diving, wind surfing and sea trips – great for a family day trip, solo experience or friends who want to explore the underwater world. The hotel is situated from a beautiful beachfront location away from Hurgahda’s touristy hustle and bustle. Yet the popular attractions and shopping and dining options are never far away. The Senzo Mall is 7km away, less than a 10-minute drive. The Grand Aquarium stands at 2.8km away from the property, the Sand City is 6.6km away. Hurghada International Airport is also 9.5km away. 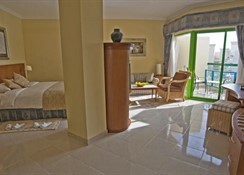 Hilton Hurghada Resort has several elegant guest rooms or suites to suit the requirement of guests. Each room comes with a private balcony or patio which provide excellent garden, pool or sea views. The rooms come furnished with fridge, tea & coffee making facilities, minibar, iron & ironing-boards and an en-suite marble bathroom. Queen Deluxe, Queen Deluxe Plus, Queen Deluxe with Garden, Twin Deluxe, Twin Deluxe Room Plus, Twin Deluxe Room with Garden, Twin Guest, Diplomatic, Family and Royal Suites are some of the luxurious room categories here. The Hilton Hurghada Resort offers ample options to cater to the guests’ palates with 11 restaurants and bars to choose from. The hotel has everything from The Lagoon specialising in fresh fish and seafood, plus panoramic views of the Red Sea, to the inviting ambience and delicious Italian cuisine of La Casa, and the relaxed 321 Lounge and bar for exotic cocktails and live performances. The Terrace Pool Bar and Waves Beach bar also offer refreshments you can enjoy during the day. There is a private beach area, lovely outdoor pool and in-house watersports and diving centre for those who wish to have a fun-tastic time in the water. There is a luxurious spa providing relaxing massages and therapies, plus a fitness centre for those who wish to stay fit. 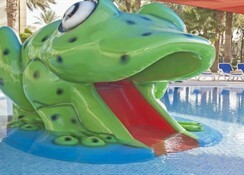 There’s a kids’ pool and Kids’ Club plus the playground will keep the tiny tots occupied. 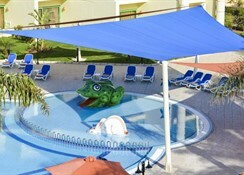 The resort offers facilities for tennis, squash, table tennis and billiards (chargeable). There’s lively entertainment organised in the evenings. Car hire and day trips can be arranged for guests who wish to explore Hurghada and beyond. Nice hotel, staff very good and attentive, always something nice to eat, lovely beach area, will definitely return. If booking book rooms in main hotel not villa's as they are a bit out dated. Rest is good inclusive food is good, rooms are good in main hotel but not super lux what you see in European hotels. Buffet restaurant was good but not great - Lagoona seafood place was very good. Staff were great and the swim-up pool bar is a lovely touch. There were some refurb works going on but the disruption was minimal. Overall - hotel a little bit tired but made up for by the attentive and friendly staff. We thoroughly enjoyed our stay at the Hilton in January 2018. All staff very couterous and friendly especially Hassan of the dining area. Fantastic Animation team. Very clean. Enjoyef the food. Wide variety. Great holiday, hotel a little down at heal but the service was great and the sun shone! Wouldn't recommend the all inclusive food, lots of good restaurants to go out and try instead! The staff at the hotel were very polite and helpful and the facilities at the hotel were very good. My daughter absolutely loved the kids pool and being close to the sea was also very nice. We went all inclusive but we didn’t really make the most of it as the food was not very inclusive of all cultures. Good quite bland and we struggled with food. The hotel didn’t mention that there’s an additional building that’s an extension and that’s where we were located so we had to cross the road and walk over into the main building every time we wanted to eat, use the pool go to the beach. The kids club were amazing and my daughter absolutely adored the staff and had fun in the evenings at the discos. We took advantage of the spa too which gave amazing hot stone massages. We had some issues with the toilet letting out a terrible smell, we reported it a few times but eventually they came to the conclusion that not much can be done. It was a nice family holiday but some wear and tear to the hotel. In need of a revamp now.